Reedy Creek Community – Expanding Hearts. Enlarging Minds. Little Opera Company of Charlotte’s Opera for Beginners! Welcome, Hannah Hoyt and Tim Laurio to Reedy Creek Community School! Fall 2018 is going to be a banner year for us all with the addition of a ten-week course in musical theater and operettas! 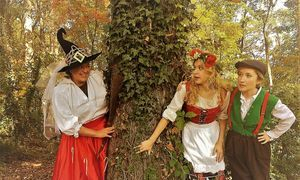 If you’re child is theatrically inclined or just loves to sing, you won’t want to miss out on this valuable training that will culminate in a Christmas production of “Songs from Hansel and Gretel.” It’s a beautiful opera by Englebert Humperdinck — I may be biased, but I think you will love it! Learn basic theater technique, choral work, dance, and a whole lot more. Location: Living Faith Baptist Church, 8600 Hood Rd. From a Charlotte Mason perspective, essays flow naturally from the mind that has been engaged with living books for several years already. The transition can be tricky, however. In this course, we will begin with detailed narration and from there transition into analyzing short texts. We will write poems and stories, dialogue, and description. Weekly lessons will include Studied Dictation, Copywork, learning to keep a Commonplace Book, a Book of Centuries, a Nature Study Notebook, and an Enquire Within. This class will require some work at home: daily copywork, daily study of one single passage for weekly dictation, and work on biweekly short essays/narration. This class will include: Grammar, Spelling, Composition, Critical Thinking, Creative Writing, Literature, Poetry, Handwriting, Punctuation, and Capitalization. Taught by Megan Hoyt, children’s book author and certified teacher with 24 years teaching/writing experience. Hannah Hoyt is a graduate of Berklee College of Music with a degree in vocal performance and film scoring, but she is also an alumni of the Charlotte Symphony Youth Orchestra and has played violin for many years. Her teaching style blends celtic and classical styles. She can’t wait to meet your young fiddlers!